Quietest, longest lasting & most efficient breathing air compressor system by design! Simple ♦ Clean ♦ Quiet ♦ Efficient ♦ Long Lasting. The Scott HushAir, Breathing Air compressor is quiet by design. Made in America, Scott utilizes the Ingersoll-Rand H15T-6 air compressor block. A large, all cast iron design, the Ingersoll-Rand block runs for years. Coastal Fire Systems still services the same compressors that were installed in 1985. That's Long Lasting! Due to its relative low speed operation (as compared to the imported pumps) the noise and vibration is the lowest in the industry. It's so quiet... The HushAir does not require sound attenuating enclosures to comply with OSHA noise levels. That's Quiet! Since the Ingersoll Rand is all cast iron, it runs cool too. With the oversized air cooled cylinders, inter-cooler tube nest and cast iron cooling fan the Scott HushAir delivers the most CFM per HP of any other brand and it does it vibration free. That's Efficient! The HushAir is designed to maximize installation options. Do you want a one piece system or would you like to install the compressor in a remote area? Put the compressor in a closet, a mezzanine or basement and locate fill enclosure is on your apparatus floor or wherever you want. That' simple! Controller: Digital X-4. Includes 1st out annunciation, service indicator lights, digital read out. Moisture and CO2 monitors, Service data, due dates and alarms. Fill Enclosure on the market! The Scott RevolveAir fills up to 40 SCBA per hour! The Scott RevolveAir Fill Enclosure is the most revolutionary system you can buy. Load and ready 1-2 empty SCBA cylinders on the outside, while two are being refilled safely on the inside. This makes the RevolveAir the fastest and safest system you can buy. It's automatic. No cascade valves to confuse the fill process. The system begins filling from storage, then automatically tops off the cylinders from the air compressor. 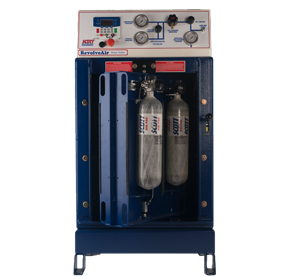 When the cylinder pressure is satisfied, the air is automatically routed to storage. All you have to do to fill SCBA Cylinders is lock the door with the push down handle. Bring your empty SCBA cylinders to the front of the RevolveAir Fill Enclosure. Attach your cylinder valves to the fixed SCBA filling adaptors on the door of the enclosure. Open the fill valves in the normal fashion, and rotate the two empty cylinders into the enclosure. Push the locking handle down and the empty cylinders begin to fill automatically. When those two empty cylinders were rotated in, two filled ones were rotated out. Remove the two full cylinders in the usual fashion and install two more empties. Continue until your fill job is complete. The RevolveAir is the fastest because there is no idle time waiting for cylinders to fill. The air flow is metered to 1500 PSI per minute so your cylinders are filled in compliance with NFPA and will not overheat. With a 15HP compressor, two storage cylinders and the RevolveAir Fill Enclosure, one operator can refill 40 cylinders per hour. It's that fast. 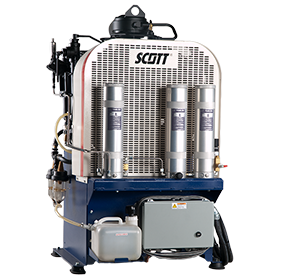 The Scott Liberty I and Liberty II Mobile Breathing Air compressors are unique in the market. 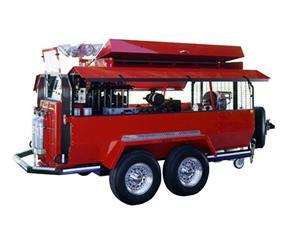 The Liberty trailers are sized around the compressor and designed for maximum ease of towing to the scene. Inexperienced trailer operators find it easy to maneuver and see around when negotiating tight streets and unfamiliar territory. Diesel? Electric? Why not both. Scott built the Liberty Series with a diesel engine and an electric motor. Plug it in to the power grid on the apparatus floor and use it as a stationary compressor. Tow it to an extended scene and generate quality breathing air and electric right off the diesel engine. 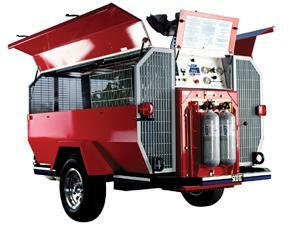 The Liberty I and Liberty II Breathing Air Trailers are fitted with an Ingersoll-Rand H15T6 compressor block. A block we know to be reliable and long lasting. ASME Storage is standard and the RevolveAir Fill enclosure is mounted right on the back end where it is convenient to access. But there is more. Both systems include an air control panel for confined space, operation of pneumatic tools or for filling stationary cascade systems. In addition there are 120V and 240V AC, 1-phase outlets for electric loads as large as 7.5 KW. 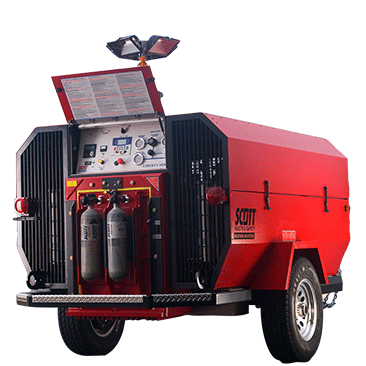 There is no other mobile air system as simple and easy to use as the Scott Liberty Series trailer. We tow our demonstration unit with a Ford F-150, pick up truck. Any vehicle that can tow 6000 LBS is suitable. Just hitch it up, plug in your lights and your stationary compressor has become a mobile breathing air center. Liberty Series Compressors are available without the trailer for those departments who want to mount it in a truck or their own trailer. Ask for the "Liberty Slip In." Custom color. Standard color is Red. Both High and Low pressure hose reels.